Thanks to NetherRealms Studios' Shaun Himmerick, we now know two things about the PSP 2: firstly, it actually exists, and secondly, Sony has sent some to developers. Sony has repeatedly said that it wasn't going to release a new handheld system this year, but by the sound of things, it's a good way along the path of having one ready for next year, after NetherRealms Studios let slip that it has a PSP 2 that it is working with. 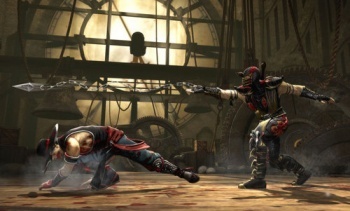 Speaking in an interview at this year's PAX Prime, the Mortal Kombat executive producer said that the studio was looking into porting the game on to the PSP2, trying to decide how much performance it could expect from the device and figuring out whether it would have to redo a lot of assets. He said that the PSP 2 was a "pretty powerful" system, but gave no further details beyond that. Apparently, NetherRealm does not have a 3DS in house yet, although it wants to get one, and will investigate the system in the same way when it does. The PSP 2 story seems to be very similar to that of its predecessor, the PSP Go. It's going to be interesting to see how many more details we learn before it's formally announced.